Valentine’s Day is just days away on Thursday, February 14th. 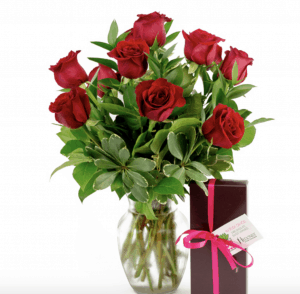 Now is the time to order your sweetheart those Valentine’s Day roses that express your heartfelt affection and love. Red roses are displayed in a classic glass vase from our flower partner in Ecuador. 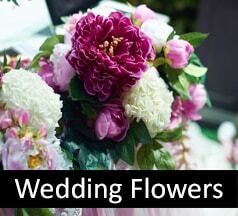 It’s a simple, yet sophisticated, floral display and offers your love to that special someone. 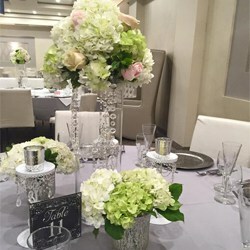 A glass vase holds two-dozen Ecuadorian roses along with greenery in a glass vase. 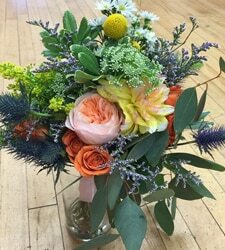 Standing nearly two feet tall, this beautiful floral display for Valentine’s Day offers red and white roses accented with Queen Anne’s Lace. The glass vase is wrapped with a festive red ribbon. This Valentine’s Day bouquet offers pink carnations and red Ecuadorian roses along with seasonal greenery in a red glass vase wrapped with a pink ribbon. 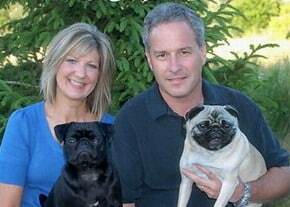 This Valentine’s Day, we have some special Valentine’s Day packages. 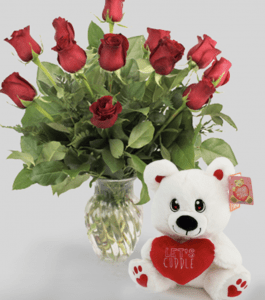 This one combines a stuffed teddy bear and one-dozen roses in a classic glass vase. 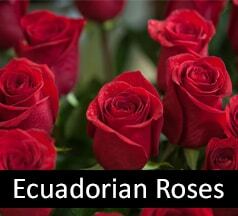 This Valentine’s Day package includes 12 Ecuadorian roses in a glass vase and locally made Hedonist chocolate selections curated for Valentine’s Day. 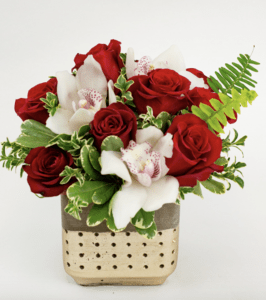 This Valentine’s Day flower arrangement showcases roses and cymbidium orchids in a concrete container accented in gold. 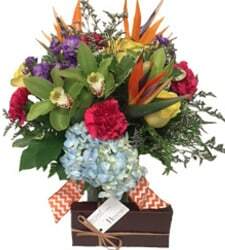 It’s time to place your Valentine’s Day order to make sure your sweetheart gets their special gifts in time! It’s Time to Start Thinking About Gifts For Your Valentine! 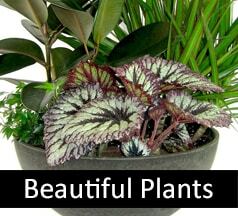 Surprise Your Loved One with Valentine’s Day Flowers Early!